Standard Solar recently completed the installation of an 865 kW solar array on the rooftop of Knorr Brake in Westminster, Maryland, which will help put the brakes on the company's power bills. The custom-designed installation at Knorr Brake—constructed by Standard Solar Inc.—consists of 2,882 solar panels and takes up about 100,000 square feet of rooftop space. It is one of Maryland's largest rooftop solar installations. 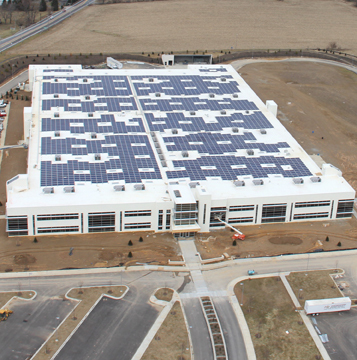 Knorr Brake Company is putting the brakes on power costs with a rooftop solar power installation at its new mass transit rail division headquarters and manufacturing plant in Westminster, Maryland, that will supply about 60 percent of the building's energy needs. David Moore, the company's director of finance, says Knorr Brake is heading off anticipated rate increases from its conventional power supplier with the purchase of the majority of its power under a 20-year power purchase agreement (PPA) at a set rate from UGI Performance Solutions, which owns the solar power array on its building roof. Solutions owning the solar array infrastructure, Knorr Brake has also saved money by not having to finance, build, and operate the solar array system themselves. The custom-designed installation constructed by Standard Solar Inc. consists of 2,882 solar panels and takes up about 100,000 square feet of rooftop space. It is one of Maryland's largest rooftop solar installations. UGI sells power generated from the 865 kW solar installation to Knorr Brake and has contracted Standard Solar to build, operate, and maintain the installation. Charles Miller, general manager at UGI, says the Knorr Brake project is the largest rooftop installation owned by the company and is three times larger than other installations they own. "The fact that Knorr was taking a greenfield approach to renewable energy spoke positively about the type of long-term partner we were going to be working with," he says. The 235,000-square foot Knorr Brake building was under construction during installation of the solar array, electrical wiring, and accompanying hardware, which provided Standard Solar with both opportunities and challenges compared to installing a solar array on an existing building. This division of Knorr Brake (part of a multinational company headquartered in Munich, Germany) manufactures and supplies braking systems, passenger doors, and climate-control equipment for all types of mass transit customers. It invested $30 million to build its new rail division headquarters. The entire building takes up 235,000 square feet and was designed taking into account the installation of the rooftop solar array. "As a company worldwide, we're very environmentally and energy conscious," says Moore. "When we built the new factory, it was a perfect opportunity for us to create an environment where we could install renewable energy on the roof. We had the footprint because it was new construction and could be incorporated into the overall design of the building." In addition to anticipated power savings, the solar installation has also helped the company pursue gold certification under the Green Building Council's LEED program. During its initial investigation of installing solar power, Knorr Brake considered three different vendors and two scenarios, where they would either build and operate the facility themselves with a payback of about 3.5 years or purchase power under a power purchase agreement (PPA) from someone else who owned and maintained the solar array. They opted for the latter option and selected the Standard Solar/UGI proposal. "We determined that the PPA was the better route to go because it allowed us to save capital for other strategic initiatives," says Moore. As the project evolved, Moore says his main concern was that the plant would have a dependable power supply because of the nature of its business, which requires the use of power by its products in a variety of voltages as well as in both AC and DC. This is not something that presented a challenge when designing the solar array hardware, as the voltage conversions are handled within the plant. However, the main combined power supply from the solar array and the conventional power provider had to be reliable and consistent. Moore says there have been no issues since the solar power array became operational about 10 months ago, and Knorr Brake will consider installing more solar power production arrays at its other facilities as opportunities become available. The 235,000-square foot Knorr Brake building was under construction during installation of the solar array, electrical wiring, and accompanying hardware, which provided Standard Solar with both opportunities and challenges compared to installing a solar array on an existing building. C.J. Colavito, Standard Solar's director of engineering, says that on the one hand, the company benefited from being involved in the design of the roof structure and electrical system to ensure that the supporting infrastructure was put in place for the solar installation. On the other hand, its workers and subcontractors were among many workers and companies on site and on the roof at the same time, which required considerably more coordination than if they were the only ones on site. Colavito adds that while installation of a rooftop solar array may not sound so daunting with the expectation that the installer is working with a flat surface, the reality is often quite different. For example, another interesting aspect to the Knorr Brake installation was the number of rooftop undulations and also having to work around other structures such as skylights and air conditioning units. This required considerable engineering analysis to avoid shading by various pieces of equipment, and addressing weight restriction issues where other rooftop equipment was situated. The design and selection of a racking supplier had to take these issues into account and this also explains why the solar array only takes up a portion of the entire roof area. The availability of rooftop space for the array was a limiting factor as to how large it could be built. The power generated by the solar array will be used by Knorr Brake instantaneously. They will be provided with a credit by their conventional power utility, Baltimore Gas and Electric Company (BGE), through a net metering and interconnection agreement for any power they generate in excess of their immediate needs and which they transmit to the power grid instead of consume on site. When the building is consuming more power than is being generated by the solar array, priority is given to the solar power generated and the conventional power meter will also spin forward, but it will spin forward more slowly because it is only supplementing what the solar array is providing. Colavito describes the size of the Knorr Brake solar installation as large based on the rooftop space it occupies, but about average by today's standards in terms of the amount of power it generates. He adds that the ability to generate solar power in Maryland based on the amount of sunshine it receives is "good" without issues like large snowfalls, as in other areas. However, its solar power generating potential is considerably less than areas like the American Southwest, where he says a comparable project that Standard Solar is working on in that area is able to generate up to 30 percent more power per panel because of the region's high percentage of sunny days. Standard Solar made the initial proposal to Knorr Brake when the company made it known that it was interested in pursuing solar power; it invited UGI to invest in the solar installation. UGI offered Knorr a PPA without them having to actually own or operate the installation. Standard Solar frequently works with several investment groups like UGI who are interested in expanding their own solar power production portfolios if projects meet their specific criteria, and they are able to provide an attractive power rate and agreement structure for the power consumer. "Standard Solar is a vertically integrated engineering, procurement, and construction (EPC) company, in that we also have our own in-house sales and development team," says Colavito. "A lot of other EPCs simply construct and execute projects, but they don't develop deals." He adds that Standard Solar develops the "vast majority" of the projects they build. "In this case, we developed the project and introduced Knorr to these types of deals and transactions, what we could do for them and how we could save them money," says Colavito. "So we developed this customer and this project and then we brought UGI Performance Solutions into the project." Generally, as part of its development efforts, he says Standard Solar not only finds a consumer for the power generated, but it also brings in the financing by offering projects to various system investors like UGI, as well as offering to operate and maintain the system. The polycrystalline silicon style solar panels on the Knorr Brake project were supplied by Suntech Power, which Colavito says "offers a nice mix of efficiency and low cost." Advanced Energy supplied the inverters, and PanelClaw supplied the Grizzly Bear galvanized steel racking system. "It was critical who we selected for our mounting system because we had to use a specific mounting system that could handle the undulations of the roof," says Colavito. "PanelClaw's Grizzly Bear product on this particular project was fantastic because it rolled with the roof undulations beautifully." The primary contractor was Standard Solar, working with subcontractors Spectrum Building Company, Monacacy Valley Electric for the electrical work, Draker for the monitoring system, and SolarBos for the combiner and re-combiner boxes. UGI's Charles Miller says construction delays during the project unfortunately did cause UGI to miss its internal goals relative to the Investment Tax Credit. "Once installed, however, the system has performed flawlessly and although the full-year data is not yet compiled, the system looks to overproduce in its first commissioned year," he says. Knorr Brake's foray into purchasing solar power under a PPA has definitely generated interest from other companies established in the Westminster area of Maryland, and Standard Solar is working to develop projects with some of them.